It’s been a month since the War Robots Lunar event was over. 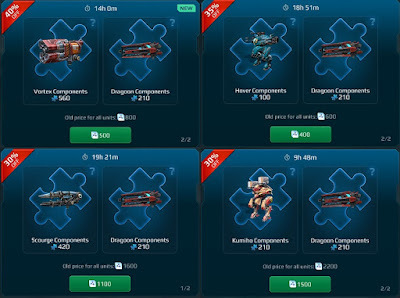 Pixonics has made several more changes and introduced more robots and weapons, and they were only available by 10,000 components of their own type. This made it very difficult to obtain and with more and more of these types of robots and weapons, the component collection also becomes more difficult especially in the black market random spin. The new robots and weapons were much more powerful. And if too many of these were in the team line up, the gameplay could really suffer and made it less enjoyable. So I do hope the gamemakers would balance the gameplay out. For example I found the Shocktrain weapon to be too powerful and a range that gives it too good a coverage. A shot from it reduced my robot durability by as much 30% and even if it bounced onto my robot, the reduction was much too devastating. If a weapon should be able to hit multiple targets should have far less damage logically speaking. The damage should be shared amongst the several robots that it hits. Despite Pixonics reducing the damage inflicted, it was still unfair to the players in the receiving end of the stick. Pixonic should take note of this. As for collecting resources, fortunately Pixonics came up with new ways of collecting component resources by way of supply line drop. As of this writing, I have already managed to collect enough Kumiho components and upgraded it to level 8. My son was very pleased to have a Korean robot, finally! And yes, the dash ability was very irritating when I had to deal with opponent players, so now I could dish out my own irritant though my robot didn’t seem to last that long in the battlefield. I found one of the ways to deal with dash robots was to shoot them from medium range. Short range CQB melee against expert players using Kumiho & Haechi robots made it very difficult to aim when they dashed from left to right and vice-versa. Your standard robots just couldn’t turn fast enough and you would tend to miss your shots frequently. The supply line drop was giving away Inquisitor components as of this writing, already I have amassed about 1800 component points. This was going to take a long while before I could collect the robot. Hopefully they would give enough of this points till I hit 10,000 before they change it to other components. Every 12 hours the supply drop would reach the limit and stop, thus you would need to diligently collect it every 12 hours. That totalled about 168 point per day for my current Gold league level. All in from zero to 10,000 components would take about 60 days! Another resource collection is the League Battle Rewards. This method I found to be much more difficult. I’m pretty much stuck in the Gold League. To maintain my league standing, I must keep winning. The gains were not much, getting about +3 to +10 rating from wins, while a lost battle would set my rating down easily by -20 or more for being at the bottom pile. It’s like 3 to 4 steps forward and one major steps backwards wiping out my gains. And a losing streak would set me back a lot more. I suppose this was also one of the penalty Pixonics might have instituted for players leaving early by way of self-destructing their robot which somehow included penalising players that didn’t fare well in the games despite playing all the way to the end? For example at my current average damage score of 300,000, and when the battle was lost and me ending up at the bottom 6th position, my rating would get a -20 over. So despite the good damage score for my level of playing my ratings still dropped. But I found my damage score ranges from 50,000 to 500,000 depending on how strong or how weak my blue team performed against the opposing red team, which could go either way of being strong or weak. By my deductions I give the win/lose chance to be about 50:50. Component collection via daily offers has been around for some months now. 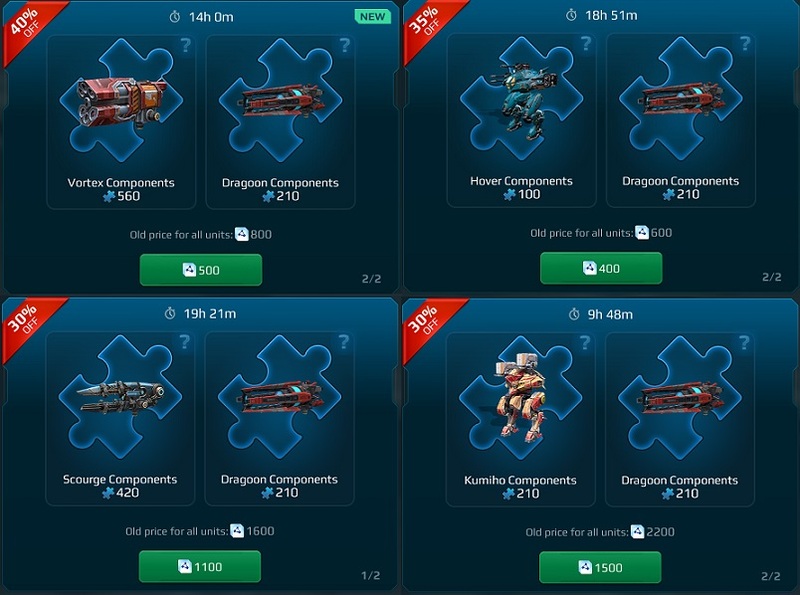 With the new the new robots and weapon introduction, they changed the offers by mixing and matching the various robots and weapons. Previously it was rather stable pair of items so I could estimate when I could obtain enough components to collect my targeted pair of items. Now by daily changes in their mixing and matching of robots and weapons components, it made it harder to collect components. For example, I’m currently targeting to get a Dragoon which they offered 210 components. Some pairing only cost 500 workshop points (or gold resources), and some cost 1800 workshop points (which also meant higher gold cost). I had to forego collecting the higher points because the secondary item that they offered was not what I want. Besides it would waste too much workshop points or gold resources. So I have to wait until the offer cycled back to the lower value. That meant more time waiting around before I could collect my Dragoon. Right now I have 9978 Dragoon components and lack of workshop points (1100 needed) to get the pairing of Scourge 420 components and Dragoon 210 components. I was also aiming secondary at collecting Vortex weapon which I currently have 7950 components but the pairing of Dragoon and Vortex only cost about 500 workshop points. I could wait till the next cycle or be impatient and raise up the shortage of workshop points by spending gold. If myself was finding some difficulty, I’m sure other players would be in a similar boat, thus ensuring not so many players have these more advanced weaponry to wreak havoc against your team or vice-versa. Sure did make me envious when I saw other players having it, especially if they had two or three of it! I don’t know how they could get it so quickly and so many at that too! My guess was that they spend real money rather than the low cost longer way that I was doing right now. Playing War Robots could be quite a uphill task as your robot and weapon levels up and face off against stronger opponents. Already many of the task and resource collection was taking up quite a lot of time. Eventually I would call it quits if the game demands was too much. For now, I want some variety of robots and weapons in my collection and I got my sights on a few more fancy items to give the battle some varied gameplay.